For the last three years, I have attempted to acquire a pair of tickets to the legendary Mixmash Records pool party hosted at the National Hotel on South Beach. The party is highly anticipated and tickets typically sell-out before fans even know they are on sale. Regarding the @MixmashRecords pool party today: Come early to avoid the crazy line! We've been sold out, it's gonna be nuts! Known to have a slew of special guest headliner appearances, some of the hottest up-and-coming DJ/producers, and of course the label’s head honcho, Laidback Luke, I was lucky enough to get my hands on one pair of general admission tickets for this years event on 3/27 and the event sure lived up to all the hype. I have attended pool parties at the National Hotel before so I knew what to expect from the venue. The hotel has one of the more pleasing aesthetics among the South Beach hotels and boasts one square pool with a waterfall leading to one long rectangular pool. Both are wading pools, so vertically challenged fans need not worry. A small sand pit surrounds the stage where the crowd begins to gather. The event was being live-streamed by BE-AT TV, an online global community connecting clubbers and electronic music fans with big-name DJs, venues and festivals. Cameras could be seen throughout the venue and the entire event could be viewed live online. 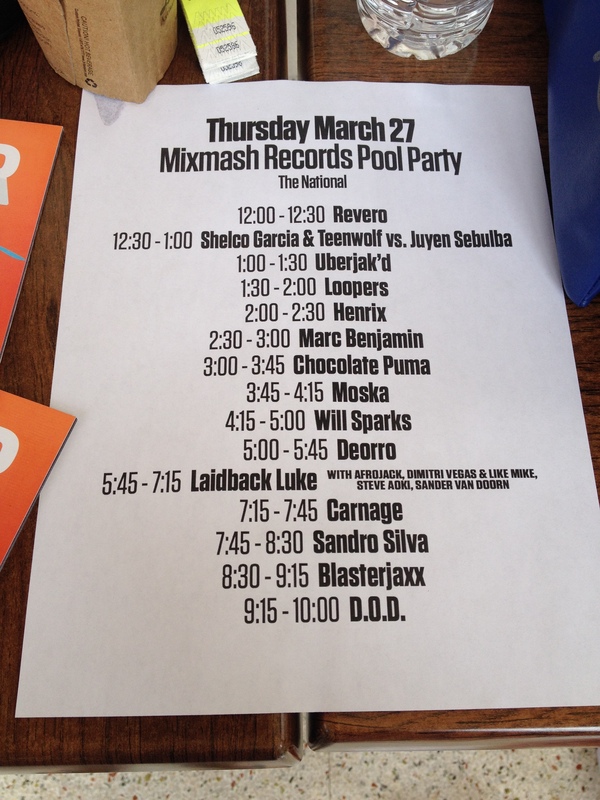 Some performances I was most excited for were Chocolate Puma, Deorro, and Laidback Luke. Upon arrival to the event, the special guests announced would include Afrojack, Steve Aoki, Dimitri Vegas & Like Mike, Sander Van Doorn, Carnage, and Blasterjaxx. The venue was already reaching capacity when Mixmash label-owner Laidback Luke took to the stage. After a few songs, he paused the music and announced the crowd was going to be part of his live music video being filmed by MTV in support of his brand new track. Everyone around us exploded as Dimitri Vegas, Like Mike, and D12 joined him on stage to perform their new single “More”. After two takes of the song (so the camera crew could gather all the shots needed for the music video), D12 exited the stage. Steve Aoki appeared next to the other DJs for a special back-to-back performance. I had planned to attend another show in downtown Miami so I left the party early. Unfortunately, I missed Sander van Doorn, Carnage, Blasterjaxx, Sandro Silva, and D.O.D. From what I could find online, I do not believe Afrojack showed to the party. Other highlights from the event include the fresh, mojito pitcher stand. If you never have gotten one, its almost worth the $70 for the cool picture of you holding it….almost. Below is my $70 picture from 2012, which was totally worth it. This years initial artist lineup for the pool party was not that impressive but based off past years lineups, I knew it would be worth the $40 general admission price. I am ecstatic I was able to enjoy the Mixmash Records pool party at the National Hotel this year, and you better believe I’ll be there in 2015.